Liquid biopsies are a way to better understand the mutational spectrum of a cancer across multiple disease sites, as the approach captures the signature of any part of a tumor throughout the body, explained Brian D. Crompton, MD. The use of circulating tumor DNA (ctDNA) and genomic profiling is critical in the treatment of patients with pediatric sarcomas. 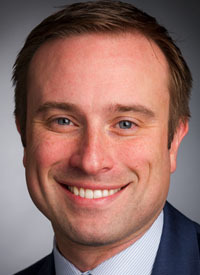 A standard tissue biopsy is sufficient when it comes to analyzing a mutation in one specific part of the body; however, there is often not enough tissue, said Crompton, an assistant professor of Pediatrics at Harvard Medical School, and physician, Pediatric Hematology/Oncology, Dana-Farber Cancer Institute. Liquid biopsies can also detect tumor heterogeneity, he added. ctDNA in pediatric sarcoma can release tumor cells into the bloodstream, leaving a liquid biopsy as an optimal method of detection. For similar reasons, this is starting to emerge as the standard of practice in the treatment of patients with non–small cell lung cancer. Despite these advantages, Crompton adds that work lies ahead to clinically prove that liquid biopsies provide benefit patients. In an interview with OncLive®, Crompton provided insight on the debate of liquid versus tissue biopsies, particularly in the setting of pediatric patients with sarcomas. OncLive: Can you speak to the use of liquid biopsies in pediatric sarcomas? Crompton: [We utilize] liquid biopsies to get a better understanding of the biology around metastatic disease and how it develops in pediatric bone sarcomas. The idea is that pediatric tumors in patients release both ctDNA and, sometimes, actual tumor cells into the bloodstreams of patients. Obviously, you can collect those samples very easily with a blood draw and identify ctDNA by detecting the mutations that are actually present in the tumor itself. What this allows us to do is understand, in patients with multiple sites of disease, what the mutation pattern is across all those tumors. What we do now with a [tissue] biopsy is with one little spot in the tumor. We understand the mutations just in that one spot. We're not understanding the mutational spectrum across all the tumors in a patient with multiple sites of disease. This is very important because if you have a patient who goes on therapy that targets the site you biopsied, but isn't at the other sites of disease, that therapy will basically be ineffective. The other thing that can happen is that you may not find anything to target in the area you biopsied. There might still be targetable mutations in all the other metastatic sites. We really have no idea. When a patient gets marked up, they're not getting biopsies from multiple sites. Therefore, in the end, we believe a liquid biopsy will give us a better general picture of the pattern of mutation across the burden of disease, not just one specific spot. What are some of the challenges in getting physicians to adopt liquid biopsies? I don't think there are a lot of challenges. One of the hurdles in trying to implement anything patient related is you have to convince people that there is potential. We're not asking physicians or patients to provide something that's dangerous. Getting a simple blood draw is minimally invasive, which is the whole point. However, to have them come in and give an extra tube of blood, and to get [all] physicians to do it takes a bit of incentive. That incentive is the promise of understanding the disease better. In previous years, we were basically relying on leftover specimens from studies that had been ongoing for decades. Now that we have these data to say, "Look, this isn't science fiction; this is actually doable," we're now able to actually embed collection protocols into all the trials going on. Off the top of my head, we are probably involved in a dozen trials where we have included language on how to specifically take samples. We need to better understand ctDNA and heterogeneity. Will the advancements seen in liquid biopsies, in terms of collecting ctDNA, result in more patients getting enrolled on clinical trials? It is important to say that we haven't yet proven that this is going to work. However, you can easily imagine that it will make it easier for patients to enroll on studies, and perhaps even bypass the need for patients—when they have recurring disease—to get a surgical procedure to verify what was present before. It could potentially make it a lot easier, but we're still talking 5 years from now or even further down the road.